Vegas has become so famous for its casinos and its nightlife that we often forget that there is a thriving city full of people who call this city home. There are businessmen and women, doctors, lawyers, and average Joe citizens who live in this city and have little or nothing to do with the casinos at all. There are entertainers and artists that live far beyond the world of the famous Strip that Vegas more often than not brings to mind. Vegas is a city that has a cultural center, a religious community, families, and family activities. It is a city in the desert that sees more than its share of sunshine while being particularly vulnerable to rain. It’s a city that is famous for it’s neon brightness while there are corners of this city that are far removed from that world that is almost as foreign to its citizens as it is to its visitors. Don’t overlook the cultural treasure trove that can be found in Vegas by limiting your experience to the Vegas Strip and the offerings of the many casinos. So there is much more to this wonderful city to see and do and enjoy. If you are looking for some great ideas to enjoy during your stay, perhaps you will find some here or at least find inspiration for your own ideas. One thing to remember about Vegas is that you are in the desert and it is sunny most of year. Even if it isn’t necessarily warm outside it’s a good idea to avoid being outdoors whenever possible or to be sure you are liberally applying sunscreen and using other means to protect your skin from the ravages of a desert sun. Here are some of things you can experience during your time in Vegas if you are willing to seek them out: King Tut’s Tomb, the car collection at the Imperial Palace, Chaos at Circus Circus, Gameworks by Steven Spielberg, The Imax theatre at the Luxor, In Search of the Obelisk at the Luxor, Las Vegas Sportspark, Lied Discover Children’s Museum, Madame Tussauds Las Vegas, Merlin’s Magic Motion Machines, Pioneer Saloon, Pirates 4D, Star Trek the Experience, and the Sunset Stampede just to name a few. The best news of all however is that there are constantly more and more activities and adventures being added to the offerings. This means that there is never a shortage of things to see and do while visiting Las Vegas so there’s never a valid reason not to come back. This list is a short list of only indoor activities; you can find a much larger list of things to enjoy if you consider the many things that can be experienced outside under the desert sun. There are other attractions that will also keep you indoors as well. There are actually quite a few museums in Las Vegas; there is M&Ms World, The Lion Habitat at MGM and the White Tiger Habitat at the Mirage. 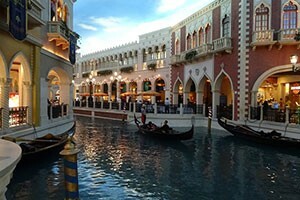 There’s also the canal at the Venetian, which is also home to “Streetmosphere,” where live actors delight and entertain you with songs and other revelry. If you’re looking for a great way to spend a day indoors, there’s no shortage of wonderful things to do and see in Vegas so there’s really no excuse. In addition to all the things I’ve mentioned above, Vegas is home to some of the most splendid shopping in America so be sure to pack your two best friends Visa and Master Card and bring them along for the ride. Also keep in mind that there is plenty to do in the great big world outside these walls and consider the great fun you can have exploring the desert climate of Nevada.